Before we get started, let’s consider how Semantic UI works. All component definitions begin with a class of ui followed by the name of the component. For example, to add a Button element you just give it a class of ui button. To add states and/or variations just insert the needed classes. For example, to create a button that changes its color to blue on hover, add the hover state class and blue variation class: ui hover blue button. The first thing we need to do is to add a Segment element which will contain our form. 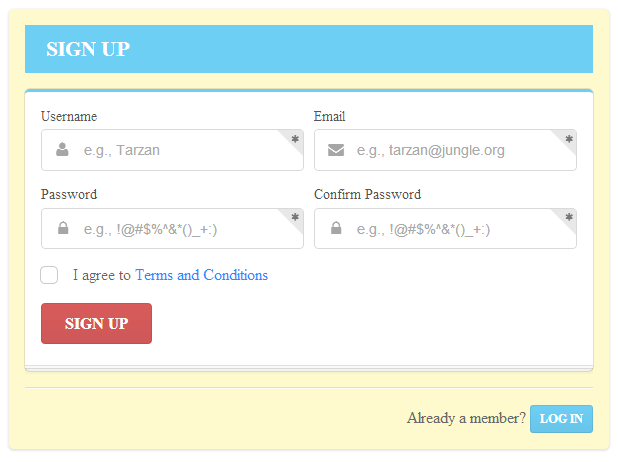 We do this by adding a div tag with a class of ui raised segment signin. For the form’s title, we use an h3 tag with a class of ui inverted blue block header. Next we create a two-column grid with a vertical divider between the columns. In the first column we add a div with a class of ui blue stacked segment, which will hold our form elements. At the bottom we put another Divider element, and a div with a class of footer. Now we need to add some styling. Put the code below inside your currently empty style tags. 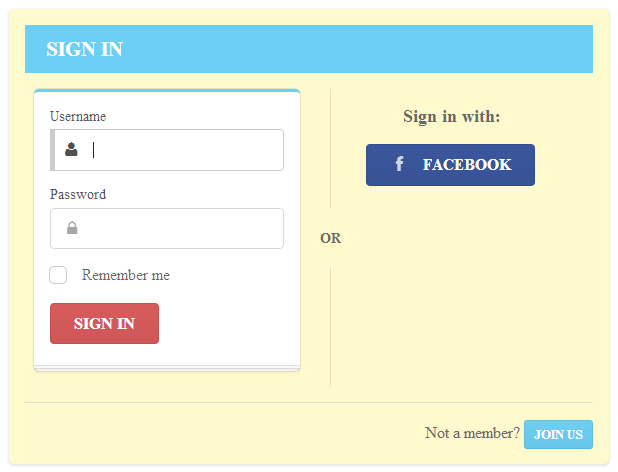 Next, in the first column (where the HTML comment says “form here”) we add the code for the form. To create the form we add a div tag with a class of ui form. Then we put two more div tags each with a class of field, another one with a class of inline field, and finally one with a class of ui red submit button. The first two fields are for Username and Password. In the third div, which is formatted to be inline, we put a checkbox. Next we add the code for the form inside the segment element, in the HTML we just added (where the HTML comment says “form here”). The div with class ui error message is put at the end of the form because the Form Validation behavior that we’ll add later on requires it to show errors to the user. Notice each of the field elements in the above HTML has a comment indicating which part of the form we’ll add in each one. Let’s do that now. Now that the two parts of our form are ready, we need to add the code for switching from one side of the form to the other. Put the following code into the empty script tag. You can read more about how the above code works in the documentation. Well done! This is a fairly simple example and with it we’ve only scratched the surface of the capabilities of Semantic UI. As you can see, Semantic UI is a new, fresh and, in some aspects, unique addition to the landscape of front-end development frameworks. From what we’ve considered here, although it’s, as of this writing, only a few months old, you can see that it’s quite promising and deserves to be on many developers’ watch lists for this year. Once again, you can download the complete tutorial file here and remember to add it inside the “packaged” folder when you unzip the full Semantic UI library.